Michelle's ocean piece features an eight foot mermaid. Her tail is encrusted with little soup cans and soda bottles, sequins and glitter. The border of the piece is made of scraps of velvet and a patchwork of other materials forms a raggedy frame. 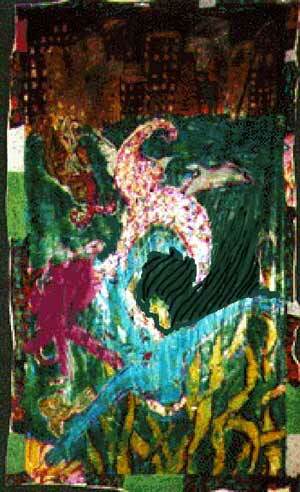 Michelle's mermaid is the subject of a book she is working on. When the ocean show came along, Michelle saw another direction her mermaid could plunge into. Michelle teaches at St. Michaels School in Cranford, NJ. She has shown her work at many museums and galleries across the country, including Lincoln Center, New York City, and as far away as Barcelona, Spain. The piece seen here is not Michelle's first to be exhibited at Robert Wood Johnson Hospital, New Brunswick, NJ. She also painted a commissioned mural for the Department of Cardiac Surgery. RETURN TO "Plastique -- The Ocean Show" index page"